Bridal Crown, Gold Renaissance Angels, white n ivory beading, Victorian Steampunk wedding Tiara, OOAK Bridal Accessory. 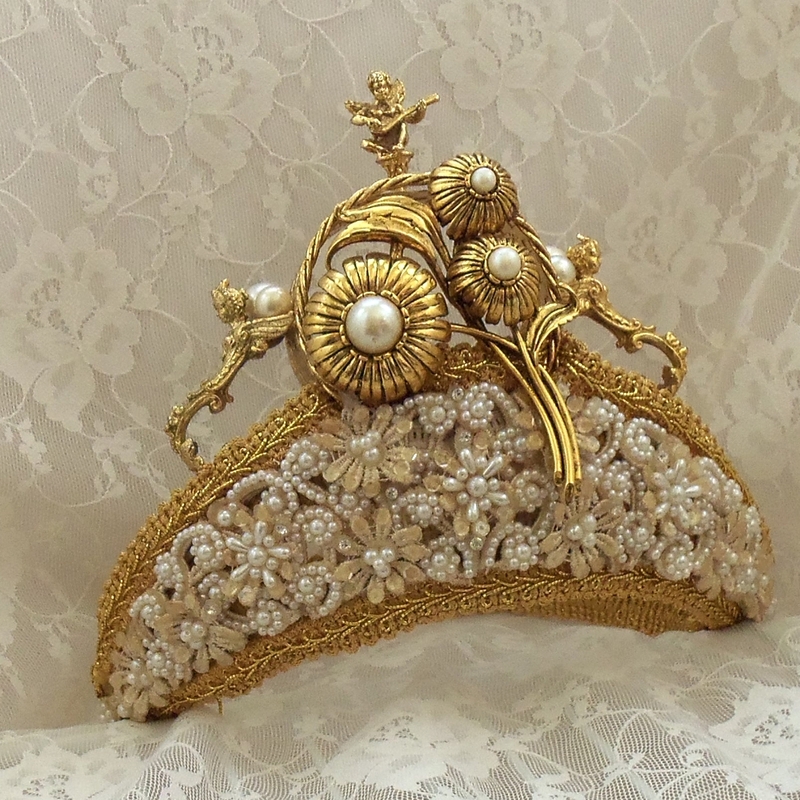 This is an exquisite vintage couture bridal crown. Three cherubs stand atop flowers and pearl beads. The adorning gold ribbon is genuine vintage silk. The ivory flowers with the pure white beading in the center is just exceptional with just a touch of tiny sequins. With or without a veil this work of art head piece adds the finishing touch for the royal bride to be. This one of a kind royal Renaissance crown measures 5.50 inches high by 5.50 inches wide in the center and it is 22 inches around. Marelle has done custom work for several celebrities and has been featured in Style magazine, Vogue for the People/U-Closet, Talk of the Town, Allure Gallery, Weekender, Bergen Performing Arts Center, Janice Charach Gallery, Kirby Center of Performing Arts, and The Forwardian magazine, just to name a few.